Oilfence | protective safety equipment – SOS Safety International Inc. Towing OILFENCETM sections is easy and straightforward. 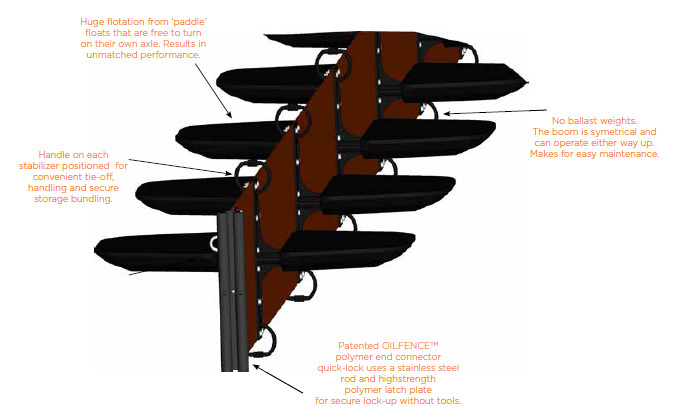 The system can include towing bridles that, like OILFENCETM section connectors, quickly secure without tools. OILFENCETM sections are very lightweight for their size. With a bridle in place, a string of OILFENCETM sections can be easily and safely towed into position. SIMPLE ROUTINE MAINTENANCE because of the design. The fully symmetrical design of OILFENCETM sections, with equal freeboard and draft, greatly simplifies routine maintenance.When cleaning is needed, each section is simply turned over. The sea growth can then die and fall off. All OIL FENCETM surfaces are smooth and non-porous, so they are readily cleaned in position with pressure washers. FOUR INTER CONNECTABLE DRAFT! FREEBOARD HEIGHTS to fit your installation conditions. You can custom fit an OILFENCETM barrier to the depth, wave and tide conditions at your facility by choosing among four available heights: 16 inches total draft and freeboard, 24 inches, 33 inches and 48 inches. 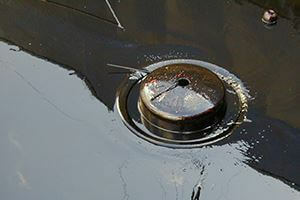 In this environmentally sensitive world, choosing a long-term oil spill containment system can be a critical decision. 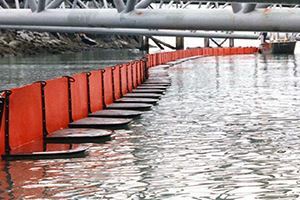 To guard against costly environmental problems, your barrier system must be effective, reliable and practical for your unique conditions. 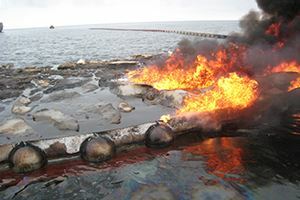 This is exactly why OILFENCETM barriers have been the oil industry’s superior spill containment solution for over two decades. In permanent installations worldwide, durable OILFENCETM booms are providing unsurpassed containment for floating materials. In many cases, this containment extends to tar balls and jelly fish with integral net systems. An OILFENCETM barrier delivers outstanding stability, buoyancy and corrosion resistance, plus easy installation and routine maintenance. 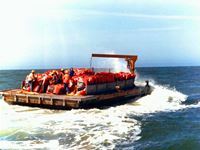 One of the unique features of this boom is the ability to operate without a traditional ballast. The top half (freeboard) is the same as the bottom half (Skirt). OILFENCETM has many applications world wide including; offshore production platforms, exploratory rigs, marine terminals, sea water intakes, oil jetties, settling ponds and many coastal applications. Designed and Engineered for Long-term Service Thousands of feet of OILFENCETM barrier have been in continuous use since 1972, a record of durability unmatched in the industry today. Extended service life is the design fundamental of OILFENCETM barriers. The system was specifically and totally planned for long-term, permenanent installation. All materials are specified for durability and corrosion resistance under extreme conditions. However, such is the durability of OILFENCETM barriers, they are also an outstanding emergency containment solution. 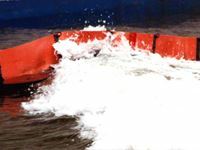 An OILFENCETM barrier provides initial response capability and durability under sustained use that no inflatable or light weight emergency response boom can deliver. In remote operations where an inflatable boom system can’t be backed up, rugged and reliable OILFENCETM barriers can form the basis for a realistic emergency response plan. OILFENCETM barriers perform to design standards in climates that range from sustained Arctic cold to the fierce summers of the Arabian Gulf. OILFENCETM installations have proven effective and practical under widely varying sea and wind conditions. Moreover, crews can easily handle routine maintenance, section by section, without removal from service. 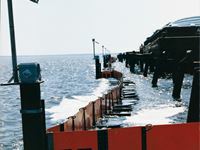 OILFENCETM booms deliver outstanding stability, even in high currents or severe off shore applications, because of their unique, large ratio of flotation span to height. This ratio is possible, because the OILFENCETM system uses extrawide outrigger flotation to support its high-tensile strength barrier fabric. Stiff, injection molded vertical stabilizers reduce bowing in currents and maintain the barrier against splash-over. The floats are mounted on axles and can fully rotate thus minimizing forces on the boom fabric. Measured to ASTM standards, OILFENCETM buoyancy scores an impressively high 10 to 1 ratio. 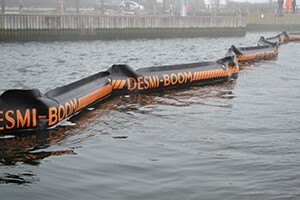 Moreover, in a very significant measure not included in the ASTM calculations, an OILFENCETM boom responds quickly to wave impact, displaying a much steeper response curve than many inflatables and conventional systems. OILFENCETM containment is also an outstanding performer in high winds. In three meter waves, it has maintained freeboard and draft integrity through 100 kilometer (60 mile) per hour winds. From durable, synthetic plastic components OILFENCETM installations reliably deliver many years of continuous and sustained service. OILFENCETM materials are advanced synthetics that are both strong and highly resistant to degradation from salt water, ultra-violet light, ozone and abrasion. OILFENCETM stabilizers and flotation components are molded of high-strength plastics, resins and fiber glass. The barrier fabric is woven polyester that is impregnated with polyurethane for very high resistance to both abrasion and tear. All metallic parts are stainless steel. With quick secure, unisex end connectors OILFENCETM containment is simple and fast to install. Sections connect securely without tools. The polymer, unisex end connectors join with a patented double quick lock that latches with twin stainless steel rods. A “super tough” nylon handle at the top and bottom of each stabilizer allows effective tie-off and handling, plus secure storage bundling.